The Emergency Responder pack is most commonly used for ambulance, search and rescue, high rise rescue, in helicopters or as a personal medical kit. In addition, the ER pack is an excellent specialty kit for trauma, pediatric, neonatal, burn, obstetrical, cardiac or respiratory patients. 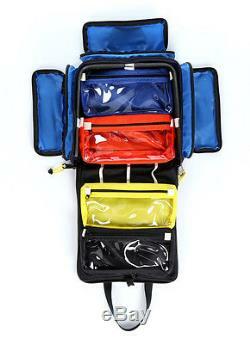 4 interior color coded vinyl window pockets. 3 small vinyl window interior base pockets. The placement and closure of these pockets is specially designed to reduce the likelihood of equipment loss. The color coding and clear vinyl front pockets allow rapid location and access of equipment and supplies, as well as, quick re-stocking. 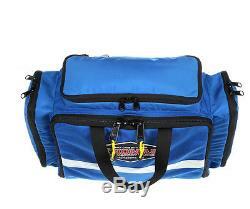 The D rings on the back of this EMT bag allow shoulder straps to be easily attached. The ladder frame of the pack can also serve as a splint when needed. 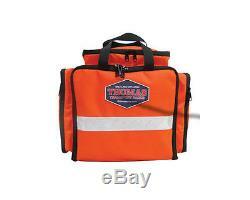 Dimensions: 12" H x 14" W x 5 D. The item "THOMAS EMS EMERGENCY RESPONDER EMT PACK ORANGE (70-1255)" is in sale since Tuesday, March 07, 2017. This item is in the category "Business & Industrial\Healthcare, Lab & Life Science\Medical Specialties\Emergency & EMT\EMT Bags & Kits". The seller is "rescue-essentials" and is located in Salida, Colorado.